Gentle giants are roaming the Ocean. Blackfish they are sometimes called. But they are not fish. They breathe like humans and their blow can be seen and heard from afar. You are out at sea or standing close to shore on the lookout for anything that breaks the water surface. The roughness of the sea makes it difficult to spot anything but waves and white crests. Suddenly you notice an unusual whitecap, a white splash. Is it the blow of a pilot whale? Their every breath is a conscious act. The whales rise to the surface every 15-20 minutes to breathe and with every exhale there is a blow. 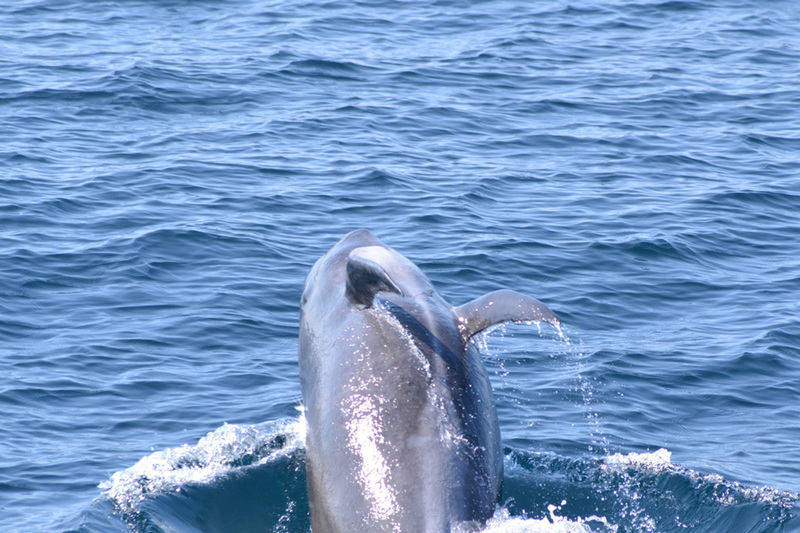 The blowhole is located on the top of the whale’s head. After a closer look you notice a dark ‘log’ floating at the surface. There are probably many more. You see, pilot whales are very social beings that live in groups called pods. What is visible to you, the ‘log’, is the upper back of the whale with its big dorsal fin. It is placed one third back of the snout tip and is chunky, curved and backswept. Pilot whales are most active after sunset and during the night when their favourite food, giant squid, is most active. They are excellent, deep-diving hunters with hunting tactics similar to those of cheetahs – high risk/high gain tactics that include super fast sprinting. In the daytime they make shallower dives and mostly rest, socialize or travel slowly, which is why the chance of meeting them is quite high. Curiosity is characteristic to pilot whales. If you are lucky, you will see a whale pop its head out of the water. This behaviour is called spyhopping. You can see the face and perhaps even make eye contact! They do this to take a look around, because they want to know what goes on around them. What is that noise? Who is that looking at us? What if danger is near? Most of the pilot whale’s time is spent near islands and in coastal waters. When the sea is extra rough during the winter, several pods seek shelter in the calmer waters around the Faroe Islands where they find squid in abundance and prepare for the rearing of their young. If you are REALLY lucky, some whales will breach right in front of you and make splashes with their tail flukes. They are also excellent surfers and love to ride the bow and stern wakes of boats, so they can catch some speed. Pilot whales know how to have fun! Would such encounters be possible around the Faroes under different circumstances? 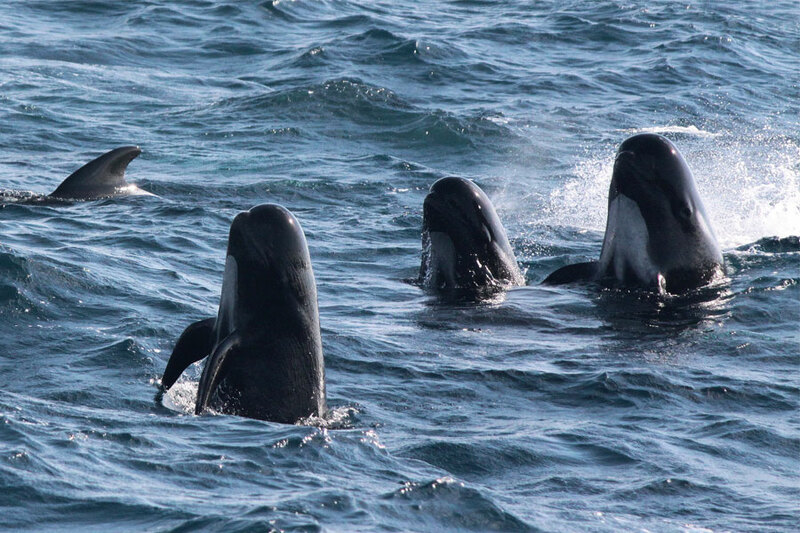 When you are out at sea and spot a pod of pilot whales, these are some of the behaviours you are most likely to see. Although most time is spent underwater, pilot whales need to surface to breathe and also want to know what is going on around them. When you look at the way they move in water and play in the waves, you can tell how much they enjoy having the oceans as their home. Every breath is a conscious choice for a cetacean, unlike humans who breathe automatically. Pilot whales rise to the surface every 15-20 minutes to breathe. The blow you can see is the exhale. You can even hear it if you are close enough. Some whales create big blows, especially the baleen whales. A pilot whale’s blow is not that impressive in comparison. They have one blowhole (baleen whales have two) that is placed at the top of the head. Sometimes pilot whales spyhop, which is when they turn vertical and pop their head up out of the water. Not surprisingly, they do this so they can take a look around. They might sense danger nearby or they are simply curious and want to know what is going on above surface. They hold themselves up by kicking with their tail flukes, sometimes for several minutes. If you see a pilot whale spyhop this is your chance to see its cute face, the upper body with its light grey anchor-shaped belly patch, and the two pectoral fins, or flippers as they are also called. With their tail flukes pilot whales can make loud slaps onto the surface of the water which creates a big splash. They might be signalling something to their mates underwater or show aggressive behaviour during an intergroup conflict. It can also simply be for the enjoyment of it. Breaching is when the animal leaps out of the water and splashes back into it. We do not know for sure why whales and dolphins breach, sometimes several times in a row, but it looks like they are having fun! Besides being a playful act, a breach for a pilot whale can also be a warning of danger directed at the others in the group, a sign of dominance or courting, or a practical way of getting rid of food scraps like squid tentacles. No matter what, seeing a whale breach is an unforgettable sight. Pilot whales are excellent surfers and like to ride the bow and stern wakes of boats and that way really catch some speed. This behaviour is called bow riding and wake riding. 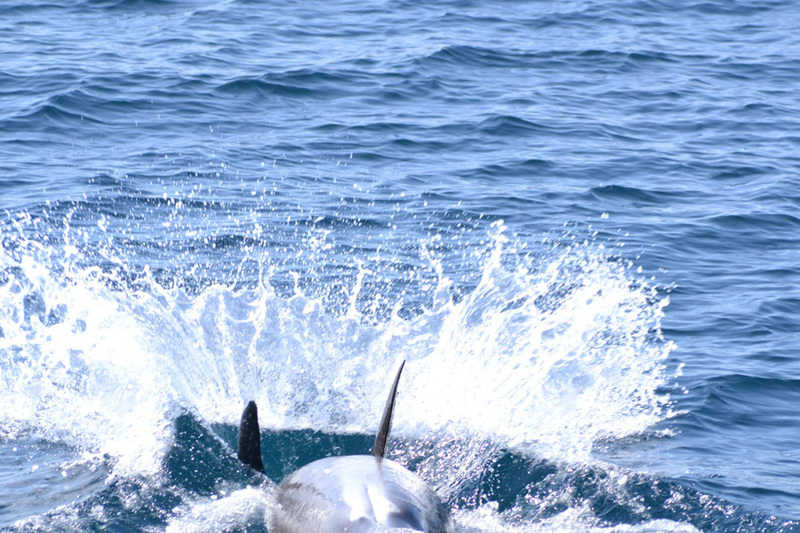 They sometimes breach and do air acrobatics or tease people onboard boats by splashing water on them. Pilot whales are less a show off and generally more calm than their smaller dolphin relatives, but they are certainly not less curious or playful. If you have ever seen pilot whales, you have noticed that they are quite large and heavy animals. They are actually some of the largest within the dolphin family, second only to the killer whale. Biologically pilot whales are dolphins and not whales, which you can read more about here. Pilot whales are black in colour with grey or brown tones. They have a light grey, anchor-shaped patch on their belly and chest which extends into a genital patch. Behind the dorsal fin they have a light grey saddle patch, and some whales also have a diagonal stripe behind their eyes. Their body is large and robust, and they have a bulbous head and a long tail stock. Males are generally larger than females. While male pilot whales reach up to 6.7 meters in body length and 2,300 kg in weight, females reach up to 5.7 meters in length and 1,300 kg in weight. The males have larger and thicker dorsal fins as well as larger, more bulbous heads. The dorsal fin is placed about one third back from the snout tip and is thick, curved, and backswept. 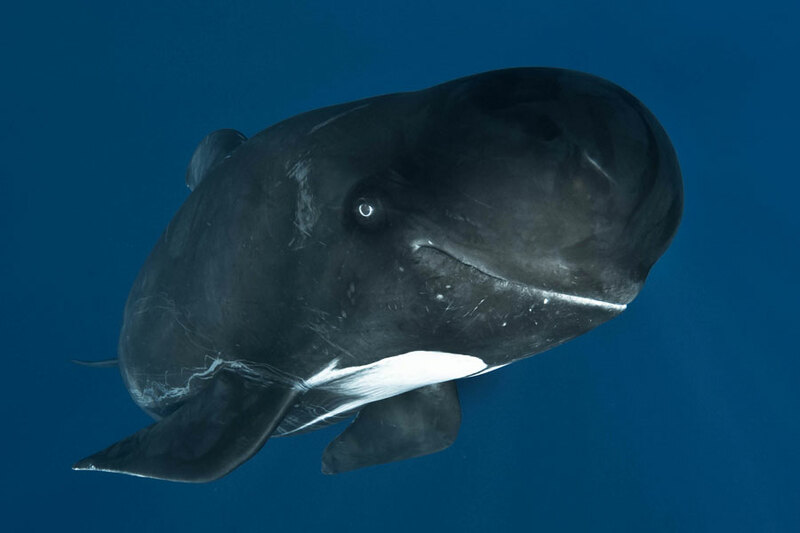 Relative to their size pilot whales have large dorsal fins that can be easily recognized at sea. The pectoral fins, also called flippers, are long and slender with a pointed tip. In each jaw they have 8-13 pairs of pointy and sharp teeth that they use for catching and grasping their prey. A newborn pilot whale is 1.6-2 meters long and weighs about 100 kg. 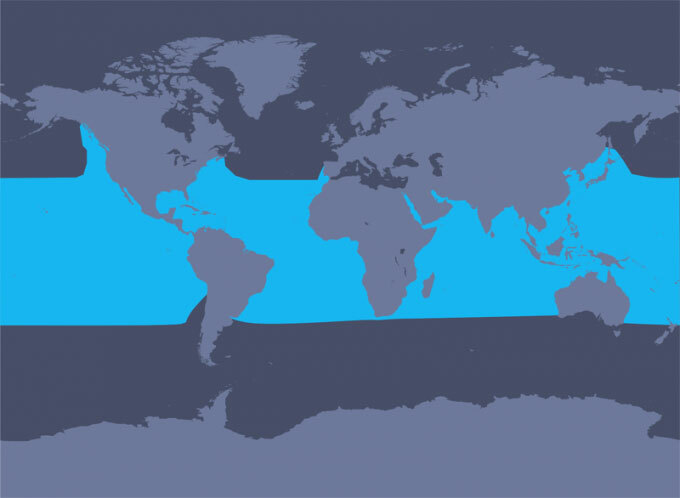 There are actually two pilot whale species: the long-finned pilot whale (Globicephala melas) living in temperate and subpolar waters, and the short-finned pilot whale (Globicephala macrorhynchus) living in warm temperate and tropical waters. 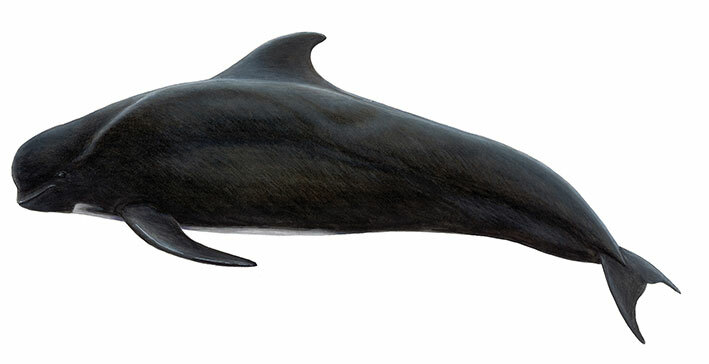 As the names suggest, the long-finned pilot whale has longer fins than the short-finned pilot whale and they are also a bit larger, but it is practically impossible to distinguish the two species at sea. A pilot whale calf is born. 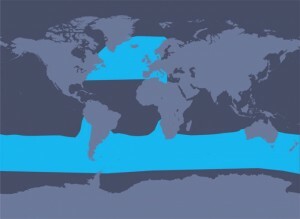 After 12-16 months of comfort in the mother’s womb it is time to leave the safety zone and enter the big Ocean. 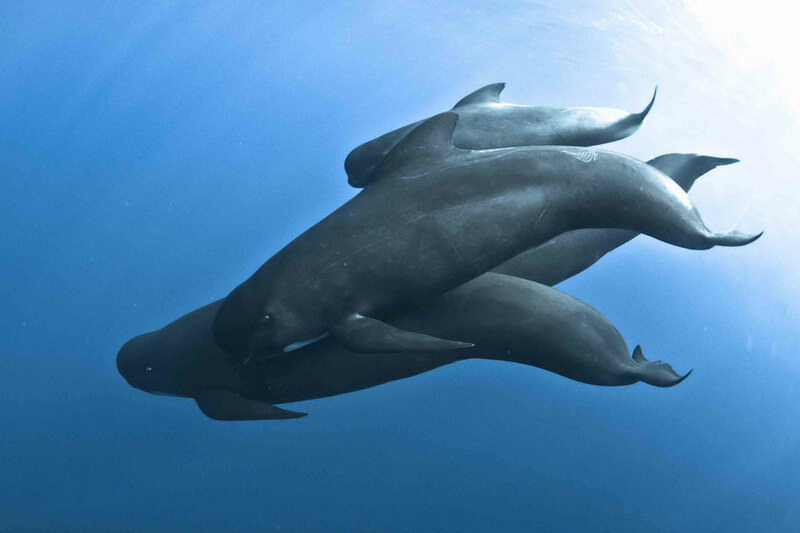 Like humans, pilot whales give birth to one calf at a time, but twins are not uncommon. A female calves every three to five years. In the Northern hemisphere calving usually happens during spring and summer. Mother and calf are not alone, though the father does not participate in the rearing of the young. Pilot whales live in groups called pods with anything from a few individuals to several hundreds – or even over a thousand! The mother will get support from other females in her pod. The calf will be nursed for two years or even longer. The mother feeds the calf by squirting milk from her mammary glands into the calf’s mouth. Two mammary glands are placed next to the genital slit from where the calf enters the marine world. To keep saltwater from mixing with the milk, the milk is very fatty and thick. It is four times as fat as human breast milk. The bond between mother and calf is very strong and the calf will stay by its mother’s side for several years. Exceptional bonds are between mother and son. The sons will usually stay in their natal pod for their entire life, only leaving the pod temporarily to find mates and reproduce. Males are late bloomers who are sexually mature around the age of 12. Females on the other hand are around 7 years old when they are sexually mature and ready to mate. Pilot whales are a polygynous species and a couple will only stay together for a few months after mating. The lifespan of female pilot whales is 60 years, while male pilot whales live for about 35-45 years. 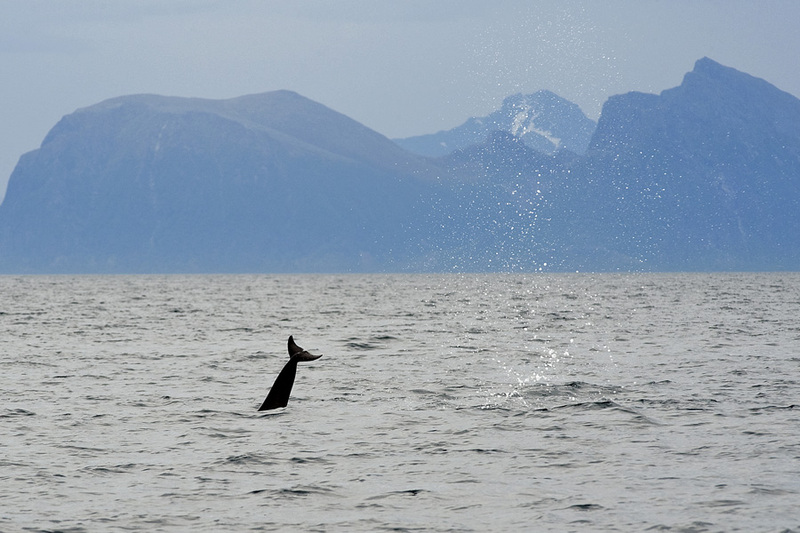 Every day of the year pilot whales may be seen roaming through Faroese waters. They appreciate the shelter that the islands provide for them. 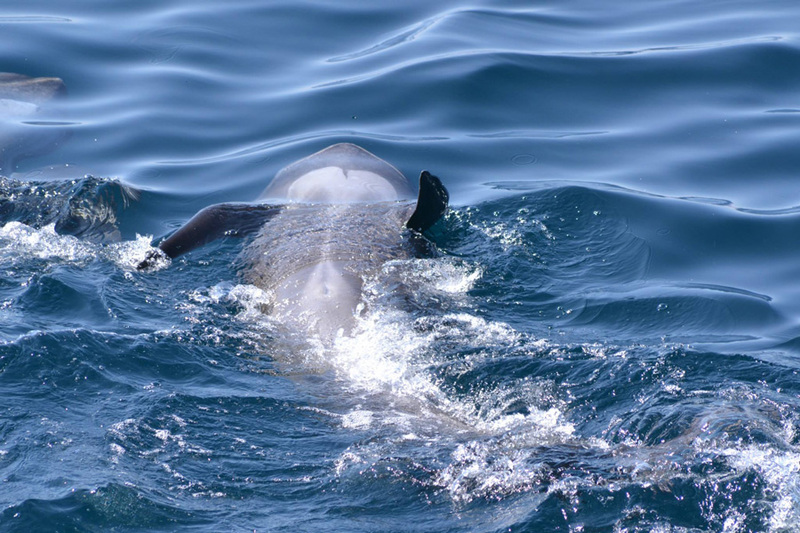 Winter can be rough out at sea, and in spring and summer, when it is time for the females to give birth to their young, shelter is particularly important. But pilot whales do not belong to any country. They are a migratory species, which means they travel around instead of staying in one place all year round. The whales visiting the Faroe Islands like to spend time in the deep water off the continental shelf. Their love for squid seems to be the main reason that they move from one place to another. 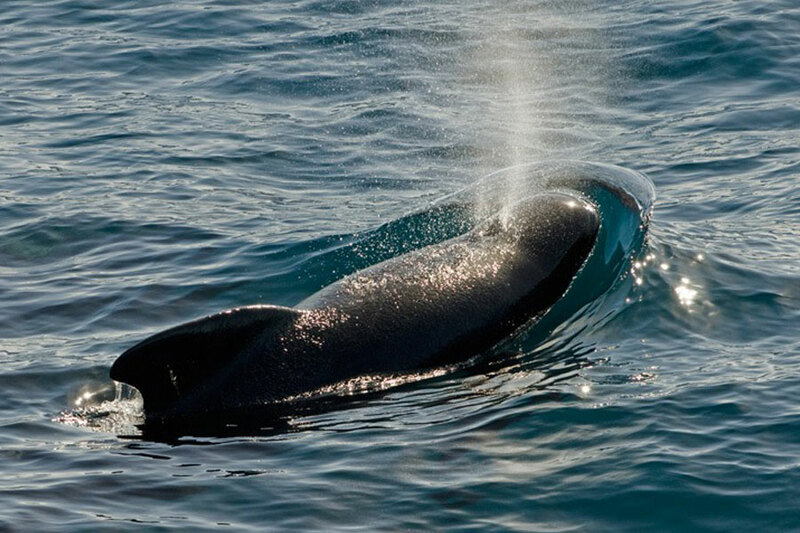 Long-finned pilot whales, like the ones around the Faroe Islands, live in temperate and subpolar waters, while their short-finned relatives live in warm temperate and tropical waters. Both species are mostly found in oceanic waters, but they also appear in some coastal areas. In some places pilot whales have established resident populations. 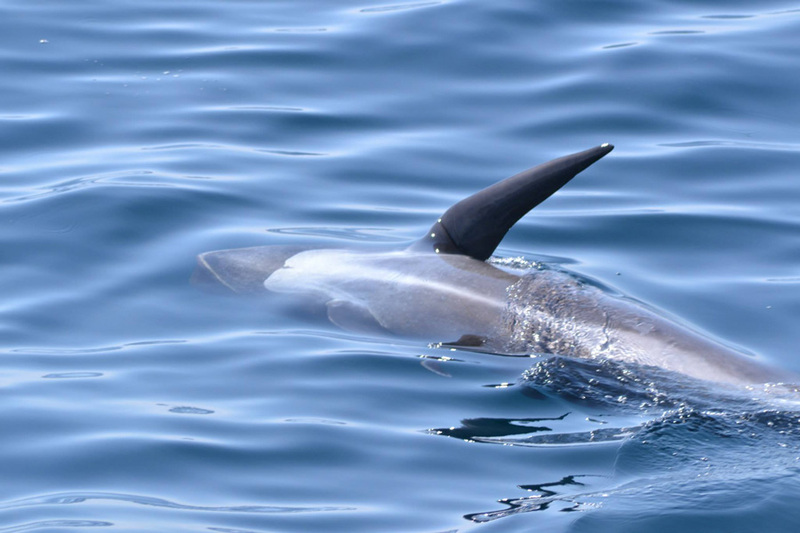 The short-finned for example off Tenerife, the Azores and Hawaii, and the long-finned in the Strait of Gibraltar and Western Mediterranean. Pilot whales would potentially become residents around the Faroe Islands too if they were not hunted. 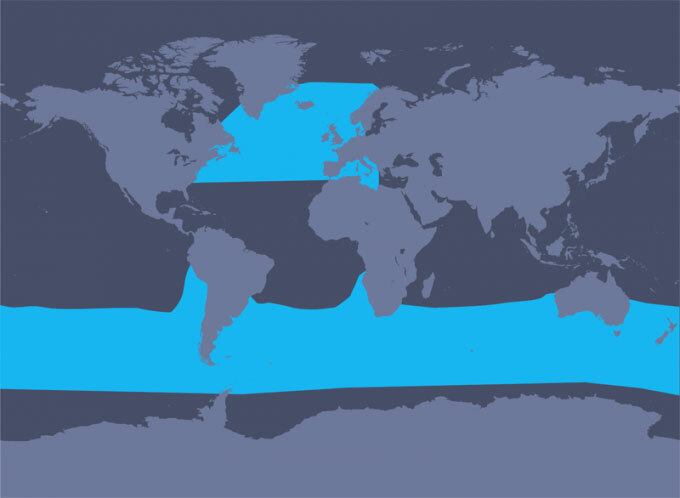 There are especially good chances to spot long-finned pilot whales in the Mediterranean Sea and off Nova Scotia, Ireland, Shetland, Norway and Iceland. Short-finned pilot whales are a common sight in the Caribbean Sea, the Gulf of Mexico and around islands off Northwest Africa. It is unknown how many pilot whales are around. Both the long-finned and the short-finned species are listed as Data Deficient (DD) on the IUCN Red List. 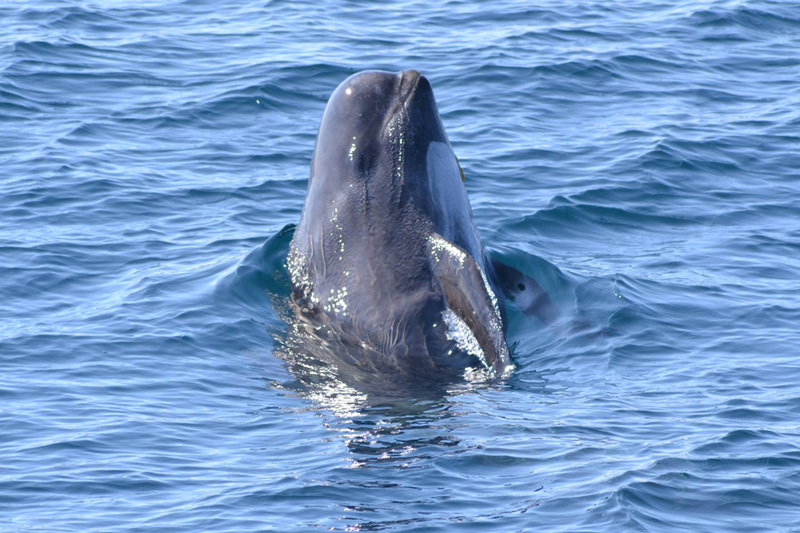 The latest numbers on long-finned pilot whales are from sighting surveys in 1987 and 1989. Back then it was roughly estimated that more than 750,000 individuals were in the central and northeastern North Atlantic. A lot has happened since the 80’s and up to date estimates are much needed. 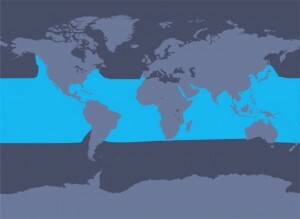 The short-finned pilot whale is estimated to exist in abundance in some areas and has been found to increase in numbers in the eastern tropical Pacific during the 90’s. But also in this case it is unknown how many whales there are globally. Counting whales is not exactly an easy task, since they spend most of their time underwater. The way researchers count whales is by making estimates based on socalled samples from whale sighting surveys. Research teams are out at sea with binoculars looking for ‘logs’ and blows and take notes of every whale they spot, including the approximate distance between the whale and the ship. A researcher then uses mathematics to estimate the number of whales in a certain area.